Have you accidentally deleted all the text messages from your phone? Don’t panic! You can actually retrieve your deleted messages with the right software – providing that this portion of the memory on your phone hasn’t been overwritten by an app update, file download or something else. So, grab your phone and let’s get those text messages back. There are several programs that you can use to retrieve lost or deleted text messages, or anything on your phone for that matter. We tried out the software MobiKin Doctor for you, which is our recommended method thanks to its speed and features. We’ll walk you through the process with the software below, but you can go directly to the website if you want to see the company’s step-by-step guide. Which phones are compatible with MobiKin for Android? MobiKin Doctor for Android supports over 2,000 Android device models, check their list of supported Android devices to ensure your phone is compatible (under the Tech Specs tab). The list is extensive, so chances are your smartphone is compatible. By and large, this software should be compatible with any Android device, including the latest models. If you’re not sure about this, it’s worth running the free trial to check. You can use the software without rooting your phone, though MobiKin guarantees you’ll still be able to retrieve the full extent of your content if you do. To find out how to root your phone, you can follow the MobiKin method here. Please ensure that you also read our complete guide to rooting. Which Apple devices are compatible with MobiKin for iOS? MobiKin Doctor for iOS is compatible with all generations of iOS devices, such as the iPhone X, iPhone XS, iPhone XS Max, iPhone XR, iPhone 8 Plus/8, iPhone 7 Plus, iPhone 7/6S/6, iPhone 6 Plus, iPhone SE, iPhone 5S/5C, iPad Air, the new iPad, iPod touch, etc. After installing the program on your PC and connecting the device, you will be prompted to allow MobiKin access to your phone. Within a few seconds, you should see a preview of your text messages on the MobiKin main screen, and recovering the data and backing it up onto your PC should be instantaneous. Once you plug in your phone, this screen will automatically appear. It will detect your device, connect to it and let you know when the process is ready to start. You can also see from the screen that MobiKin can be used for Android SD Card Recovery and as a Super Toolkit. Once it is connected, your phone’s data will be displayed, such as model, system version etc. and you will be given the choice of what kind of data you want to retrieve. As you can see from the screenshot below, you have several options of things to recover: contacts, photos, messages, call logs, photos, videos, audio and documents. Select ‘Messages’ and click Next. Your data will be retrieved in a few moments and will be displayed as shown in the screenshot below. Here we have selected all the categories but if you’ve only selected ‘Messages’, you will only see that section. Choose to only display deleted items (in case you have a ton of messages), which is easier for filtering. Either select each individual message or you can select them all by ticking the checkbox in the top bar. Next, select Recover to retrieve the lost or deleted data. Once your data is recovered, you will be asked to save it directly onto your PC. Choose or create a folder where you want your messages to be saved. This work a little differently depending on whether you’re running MobiKin Doctor from your Mac computer or Windows PC. You don’t actually need to connect your iOS device to the Mac for this to work. Instead just launch Mobikin Doctor and it will auto detect and display all iTunes files of your iPad, iPhone or iPod which has ever synced with iTunes on your Mac. The data in the iTunes backup file will be categorized into specific folders. Click these folders you can preview the detailed contents in the right panel. Text contents will be displayed in list view mode while the media files can be viewed in the Thumbnail view mode. Find the data you want to extract or restore, and then check them one by one. Connect your iOS device to the PC, launch Mobikin Doctor and hit ‘start scan’. The data found on the device will be categorized into specific folders. Click these folders you can preview the detailed contents in the right panel. Text contents will be displayed in list view mode while the media files can be viewed in the Thumbnail view mode. If you don’t have your device to hand, then you can also run Mobikin Doctor on your Windows PC without connecting the device and select “Recover from iTunes Backup File” on the top menu to scan your iTunes backups for the files you want to recover, text messages included. Another option in Mobikin Doctor is “Recover from iCloud Backup File”. This will require you to log in to iCloud with your Apple ID and password and then you can scan your iCloud backups for the files you want, just as with iTunes. Go to Settings, then find Google (Services & preferences). Tap it, scroll down and go to Backup. Enable Back up to Google Drive. You will be asked to add an account to back up to. After that simply tap Back up now. This could take a while depending on how large the files are. Afterwards, your call history, contacts and text messages should be safely backed up. However, if you specifically want to back up your text messages and nothing else, you could use a third-party app instead. SMS Backup+ is a great way to do so and it’s free. The app can back up call logs, SMS and MMS to your Gmail. Of course, you will need to connect your Google account to do so. After doing that you can choose when the back up is performed and what you want to be saved. You will find your messages in a folder usually named SMS in your Gmail – convenient and easy. Apple also provides extensive backup tools based on your iCloud or iTunes account. 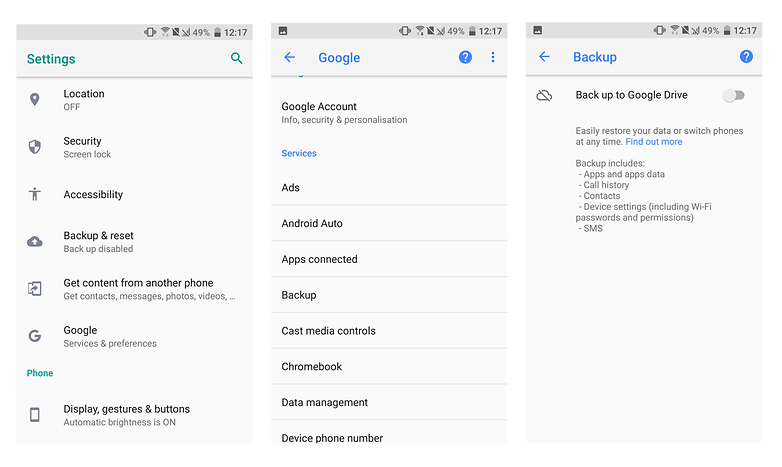 If you have ever made a backup to either of these services, your text messages should also be available to be recovered from the backup. By default, you should have created a backup of your phone’s data, including messages, every time you synced with your PC or Mac, so you can try recovering deleted text messages via an iTunes backup. All the data you previously backed up will now overwrite the data on your phone. It will take a few minutes and yes, anything you saved after the backup will be lost. As long as you didn’t back up via iTunes after deleting those messages, they should now be back on your phone. If iTunes didn’t work, then there’s always iCloud, though specifically trying to restore text messages can be tricky. When Apple introduced Messages in iCloud a couple of years ago, you need to be aware that while enabling this syncs your messages across all your devices which use the same Apple ID, there’s also a catch. Because if you delete your messages from one device with iCloud sync, those messages also get deleted from the other devices. Furthermore, messages are not included in an iCloud backup. If you really need to restore your messages via an iCloud backup, you need to factory reset your iPhone and then restore it from an iCloud backup that was made before the text messages were deleted. This is a drastic step, so first make sure you have such a backup in the first place by checking in Settings > [Your Name] > iCloud > Manage Storage > Backups. Note that the last successful iCloud backup time/date is always displayed right below the Back Up Now button. Scroll down to the General menu and tap it. At this stage, you’ll be presented with a number of reset options, ranging from a simple reset of iPhone’s settings to resetting its dictionary or home screen layout. There’s nothing specifically called “factory reset.” The option you want is Erase All Content and Settings. Select it. It can take a few minutes to erase everything depending on how much data you have. But at the end of the process, your iPhone should restart just like new. When it restarts, select to restore via the iCloud backup that contained your deleted texts. Have you ever deleted or lost your text messages by accident? Did you manage to recover them? Have you got a better way than with Mobikin Doctor? Share your tips and experiences in the comments below.